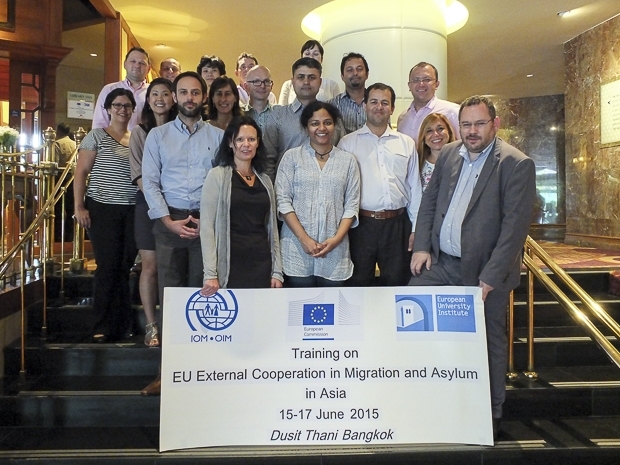 On 15-17 June, the European Commission organized in Bangkok, Thailand, a three-day regional training workshop on “EU external cooperation in migration and asylum in Asia” facilitated by Iván Martín, Part-time Professor at the MPC. The workshop was addressed to EU officers in charge of migration issues and projects in EU Delegations throughout Asia. It was held in the framework of the ETEM V Project (External Thematic Expertise on migration to the European Commission), implemented by the Migration Policy Centre in the framework of a consortium led by the International Organization for Migration (IOM). Two of the participants in the training workshop came from the EU Delegation in India, which manages the CARIM-India project (Developing a knowledge base for policy-making on India-EU migration) carried out by a consortium led by the EUI. The next ETEM V regional workshop for West and North Africa will take place in Dakar, Senegal, in September.